Vocalist/bass guitarist/songwriter Glenn Hughes is a true original. No other rock musician has carved such a distinctive style blending the finest elements of hard rock, soul and funk. That astonishing voice is Hughes' calling card. He's known as a singer's singer: in fact, Stevie Wonder once called Hughes his favorite white singer. Hughes, a native of Cannock, England, absorbed all kinds of influences, including early British hard rock, the Beatles and, most importantly, American soul and R&B. The first important band Hughes was a member of that achieved notable success was Trapeze, while in 1973 he joined one of the most popular bands in the world, Deep Purple. The trailblazing hard-rock legends had just weathered the departure of vocalist Ian Gillan and bass guitarist Roger Glover, but guitarist Ritchie Blackmore, keyboardist Jon Lord and drummer Ian Paice continued with the addition of Hughes and David Coverdale. Any skepticism was squelched with the 1974 release of Burn. This stunning album rejuvenated the band and stands tall among Deep Purple classics. In the halcyon days, Purple headlined at the famous California Jam in 1974 in front of quarter of a million people. World tours via Purple's own jet plane, 'The Starship' and two more studio albums later, (the Hughes influenced Stormbringer and Come Taste the Band), Deep Purple finally split in 1976. Now living in Los Angeles, Glenn's first solo album Play Me Out was released in 1977. He joined former Pat Travers guitarist Pat Thrall to form Hughes/Thrall, which released an acclaimed self-titled album in 1982. 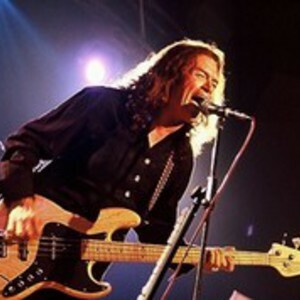 Throughout the '80s and '90s, Hughes made countless guest appearances (both credited and un-credited) as a vocalist, bass guitarist or songwriter on other artists' albums, in particular he appeared on the vastly underrated Seventh Star, was officially credited as 'Black Sabbath Featuring Tony Iommi'. Hughes and Iommi remained friends and in the past few years they have released one brand new studio album together. Since 1992, Hughes has toured extensively in Europe, Japan and South America in support of solo albums such as Blues, From Now On..., Feel, Addiction, The Way It Is, Return Of Crystal Karma, Building The Machine, Songs In The Key Of Rock, Soul Mover and Music For The Divine. Soul Mover saw the continuation of the successful creative partnership with Red Hot Chili Peppers drummer Chad Smith that began with Glenn's live DVD Soulfully Live in the City of Angels (2004). Soul Mover was voted 12th best album of the year by highly influential UK magazine CLASSIC ROCK. After the release of his last studio album, the successful Music For The Divine in 2006, 2007 saw Glenn make successful tours of Russia, South America, Italy, Norway and Spain, along with solo dates in London - at the prestigious Shepherds Bush Empire - Bulgaria and Greece. 2007 also saw Glenn headline at festival appearances in France and Norway. Glenn also took part in the Rock and Roll Fantasy Camp in New York, which was highly successful and he also appeared as a guest presenter at the Classic Rock Awards in both 2006 and 2007. Another highlight of a diverse and colorful year were the 2 sold out solo shows at the famous Whisky in Los Angeles and BB King's in New York. 2008 saw Glenn undertake another extensive European tour; including a month long trek across Russia, festival appearances, and his first live shows in Belarus, Estonia and Romania. Another highlight was Glenn?s appearance in London at the Childline Charity concert in March 2008 where he performed a short set of Deep Purple classics with Purple drummer Ian Paice. This was particularly poignant as it was the first time the pair had played together since the Purple days. Ironically, in June 2008, Glenn played in Liverpool, England for the first time in over 30 years; a triumphant and emotional return to the city where Deep Purple Mark IV played their final ever concert before disbanding in 1976. Other highlights of 2008 include Glenn?s live on air performance on the USA radio show Rockline, and his first appearance in New Zealand since 1975 with Deep Purple, when Glenn brought the house down at the G-Taranaki Festival in July. Glenn's most current studio album, the 2008 release "First Underground Nuclear Kitchen" is the latest chapter in an extraordinary musical evolution, and is quite possibly the most compelling and positive musical statement in a distinguished career already abundant with highlights and milestones. Chad Smith again plays out of his skin on the drums, and Glenn has rarely - if ever - sounded more inspired, written with such grace, or sung with more passion. Another world jaunt accompanied the release, carrying on into 2009 with tours of Europe, Russia, South America and selected shows in the States including sell out shows in LA and NYC. 2010 was one of the most exciting and prolific years in Glenn's career as it saw him recording and touring in a new supergroup project, BLACK COUNTRY COMMUNION with guitar star Joe Bonamassa, keyboard player Derek Sherinian (Dream Theatre) and drummer Jason Bonham, son of the late Led Zeppelin legend John Bonham. The band released their debut album on September 20th, 2010. The album went to #13 in the Official UK Album Chart and #1 in the Official UK Rock Album Chart. Produced and mixed by Kevin Shirley (Aerosmith, Iron Maiden, Black Crowes, Page and Plant, Journey etc), this will be another world-class musical statement that will raise the bar for rock singing yet again. In November 2010, Hughes was awarded the ChildLine Award at Classic Rock's Roll of Honour. Glenn and BLACK COUNTRY COMMUNION released their second album, "2", in 2011, followed shortly afterwards, by their debut live tour encompassing the USA, UK and EUROPE. Currently they have their third release, "LIVE OVER EUROPE", recorded live while on the European leg of their debut tour, riding high in the charts around the world. "LIVE IN EUROPE", is now available on CD, DVD, Blu-ray, Vinyl and as a digital download from various online retail outlets. Glenn had his AUTOBIOGRAPHY published in 2011, in both hard and soft cover editions. The Number 1 best seller is now available at all good retailers, both online and at traditional brick & mortar stores! Glenn will be touring extensively throughout 2012, coast to coast and around the world, both solo and as a member of Kings Of Chaos and Camp Freddy projects. So make no mistake: the Voice of Rock never left the building.